About Acrats ACRATS promises to give you the best aircraft structural training! Trainees will learn more from a training course if they learn and experience the principles, are allowed to make mistakes and are able to experiment with guidance of an experienced specialist/instructor. The training passion that our instructors have stimulates students to be eager. The certificate is not the goal of the training. The goal is train the student to be able to perform individual fabrication and repair of composite parts. Therefor learning to understand the principles of composites, experience working with composites and learning the do’s and don’ts are important aspects for trainees to become specialists. Proper training is one of the best investment an organization can make, therefor the saying: "If you think training is expensive, try an incident". Our composites training for example, starts with the awareness of handling and dealing with composite and toxic materials. During manufacturing or repair of composite parts, it is important for the composite worker to know what the influence of the conditions is on the end result. 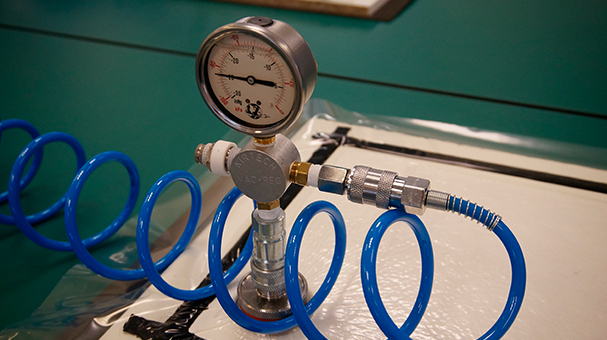 Temperature, humidity and dust for example can have a significant impact on the quality of the product, depending on the manufacturing or repair stage. This cannot be tested or measured afterwards. Also the knowledge of when to use what kind of gloves and other protection means for example is important in the process. Edwin has over 13 years of experience in aeronautical engineering, logistics and maintenance management. Rick has over 12 years experience in hands-on composite repair and as a composite repair trainer at the Royal Netherlands Air Force. Dave has over 14 years experience in hands-on sheet metal manufacturing, inspection and repair. Before he become an instructor at ACRATS he was Certifying Staff at Fokker Services.